Sports - What sports has the sports fan covered? The picture to the Left is of New York Yankees Curtis Granderson sliding back into first base before Adrian Gonzalez of the Boston Red Sox could tag him out. This picture was taken by Shawn Hansen. My photographers name is SM.Hansen. 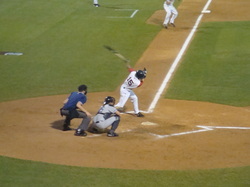 As an intern with 980 WCAP AM in the summer of 2009, I was a statistician for a hand full of games for the Lowell Spinners, the Single-A affiliate of the Boston Red Sox. I also published articles about the 'Spinners in The Valley Patriot back then. Covering the Lowell Devils 2009-10 season at the Tsongas Arena, they netted in a record of 39-31-0-10. Going to nearly every home game that season, a highlight of the year was interviewing Jarvis Green of the New England Patriots when he visited the Tsongas Arena. 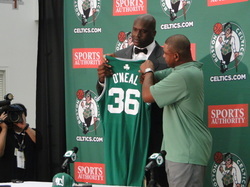 Boston Celtics - Went to the Press Conference for Shaquille O'Neal. After playing with the Cleveland Cavaliers in the 2009-10 season, O'Neal was signed by the Boston Celtics in the off season to a two year deal reportedly worth $2 million. Before taking center court at the T.D. Bank Garden, O'Neal had a press conference at the facilities in Waltham, MA. Being a huge Shaquille O'Neal fan for his entire career, I thought it was amazing that the 7'1 Man of Steel came to finish his career in a Celtics uniform. 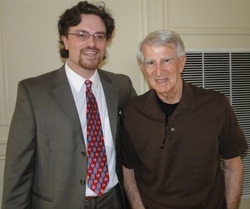 Covering the 2009, 2010, 2011, and 2012 Greater Boston Sports Collectors Club shows at the Shriner's Auditorium in Wilmington, MA, I have interviewed a slew of current, and ex athletes. I have also covered a show with Sure Shot Promotions in Braintree, MA that Rajon Rondo was signing exclusively with Sure Shot Promotions, and New England Picture. I have covered the Beantown Bonanza in Quincy, MA, and have covered shows with Rich Altman of Hollywood Collectibles out of Hollywood, FL. The shows he put on were at the Shriner's Auditorium as well as the GBSCC shows. It would have been nice to be in the Sunshine State for a while, but as it says in the song "Dirty Water" by The Standells, "Boston you're my home." In this picture, Hall of Fame Leftfielder Jim Rice of the Boston Red Sox (1974-89) is having an in depth conversation with Brian "The Limo" McCauley of Tewksbury, MA. McCauley loves sports, comic books, and music, and dreams to become a broadcaster one day. Each GBSCC show I cover, McCauley is talking to celebrities. 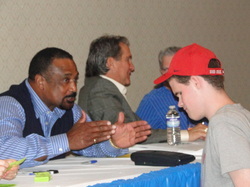 I have seen him talk to Jim Rice (Picture to the Left), Dennis 'Oil Can' Boyd, Bill 'Space Man' Lee, Sam Jones, Mike Schmidt, John Havlicek, Mo Vaughn, Cecil Fielder, Patrick Chung, Dennis Rodman ... the list goes on !! !